(Bloomberg) -- Three months after Nikki Haley stepped down as U.S. ambassador to the United Nations, the Security Council is debating issues central to President Donald Trump’s foreign policy agenda without a permanent American envoy there to make his case. Trump has yet to send his nomination of Ambassador to Canada Kelly Craft to the Senate after former State Department spokeswoman Heather Nauert withdrew from consideration in February. That void on Trump’s national security team is in addition to his reliance on an interim Defense Department chief, Pat Shanahan, who’s already the longest-serving acting secretary in the department’s history. The U.S. seat at the UN isn’t empty -- career Ambassador Jonathan Cohen is widely praised for filling in as head of the U.S. mission -- but the lack of a top envoy means American allies and rivals know they don’t have a counterpart with direct access to Trump like that of Haley, a former South Carolina governor who demanded Cabinet-level status to take the job. The gap was apparent this week, as diplomats criticized Trump’s decision to recognize Israeli sovereignty over the Golan Heights. On Tuesday, the ambassadors of Belgium, France, the U.K., Germany and Poland stood outside the Security Council in a display of European unity as they spoke against the U.S. move. A day later, during a special debate on the Golan, the U.S. looked isolated as, one by one, ambassadors condemned its breach of UN resolutions. Analysts say Haley, complimented even by her rivals for her political acumen and rhetorical skills, might have muted the criticism by saying Israel could never let Syrian leader Bashar al-Assad retake the Golan and by pressing allies to ease their criticism. A State Department official said Cohen and Cherith Norman Chalet, the ambassador for UN management and reform, are advancing U.S. interests and that it’s business as usual for the American delegation. Craft is likely to be nominated officially in a matter of weeks, after which she’d begin formally preparing for her Senate confirmation hearing, according to an outside adviser involved with her nomination who asked not to be identified. But former and current diplomats say they note a lack of urgency about her nomination. That’s seen as part of a broader lack of concern at the White House about filling key diplomatic roles. While Secretary of State Michael Pompeo has moved to accelerate nominations, many posts -- including deputy secretary of state for management and ambassadors to Brazil, Singapore and Egypt -- remain unfilled. Yet the Trump administration still turns to the UN for many of its most pressing priorities. This year the U.S. has sought backing for its efforts to isolate Venezuelan President Nicolas Maduro, a bid that was vetoed by Russia and China. And it needs to keep support unified for sanctions targeting North Korea over its nuclear program amid calls to ease up on some restrictions. 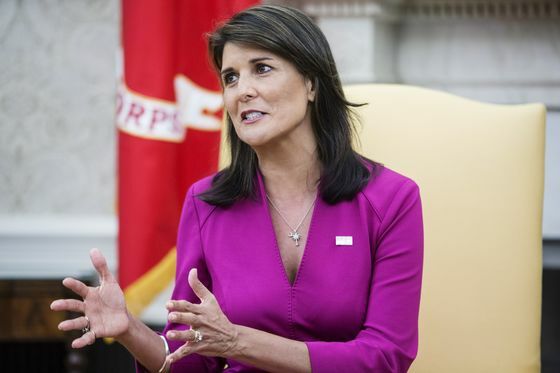 Should she win confirmation, Craft’s arrival won’t necessarily change the perception that the U.S. is downgrading its relationship to the UN. While Craft can boast of two years of diplomatic experience as ambassador to Canada, she’s also seen as a wealthy Trump donor -- the type of envoy more typically sent to postings in Paris or the U.K., not the United Nations.